The Black Isle is only 10 minutes from Inverness yet offers Otters, Dolphins and even Wildcat if you are lucky enough to be on the prowl at night. The combination of forests, farmland and internationally important estuaries makes this place a real gem. 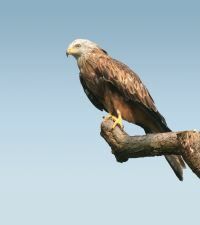 There is also the possibility of Red Kite or two! Day or half-day trips are available. This half or whole day tour can start from either Fortrose or Rosemarkie, they are only half a mile apart. We will walk along the beach towards Chanonry Ness, looking for all sorts of interesing animal and plant life on the way. Once at Chanonry Ness we will keep a look out for Bottlenosed Dolphins, this is the best palce in Europe to see them and in the summer we have a very good chance of doing just that. If you want to extend the day we can explore the beach at Rosemarkie and head up into the fantastci woodland at Fairy Glen. There are always lots of seabirds to see and often good sightings of raptors above the seas cliffs of Rosemarkie. Both villages have excellent tearooms and pubs. We will cover 3 to 4 miles during the day. This town is a hidden gem, with wonderful Georgian and vernacular architecture, many stories and a superb location. We will have a walk along the beach and up to the South Sutor, where you will hear about giant shoemakers and keep an eye out for the Bottlenosed Dolphins. For the half day we will decend back to Cromarty. This walk is just over 3 miles. To extend to a full day we can take the Ecoventures Dolphin watching boat (highly recommended) or take a longer walk along the clifftops of the South Sutor. Both these sites have a regular bus service from Inverness or Dingwall. I would recommend taking the bus if you are coming from these towns, as you will get a great view of the Black Isle on your trip over and minimise your carbon footprint. I can send a bus journey - sites of interest map, if you will be travelling by this form of transport.